"Law is a Branch of Ethics." In theory nonfeasance is distinct from misfeasance and malfeasance. Malfeasance is any act that is illegal or wrongful. Misfeasance is an act that is legal but improperly performed. Nonfeasance, by contrast, is a failure to act that results in harm; by public officials as it appears to UARF that Virginia's Governor is carrying out in the instant matter by not immediately setting pen to paper and penning a pardon for Montgomery. Virginia's Constitution sets no rules for the granting of a pardon by the Governor except those found in Art. 5, Sec. 5., and neither does Virginia's Code § 53.1-229. Yet, we hear from Virginia's Attorney General that the reason the reason McDonnell has done nothing is that Montgomery's lawyer has not asked him to. That seems to be a poor excuse for the Gov to do nothing to fix this wrong. As for Montgomery's lawyer now filing papers and request that is a matter between those two and that may just be settled at a later time by Montgomery. Its probably no more than a matter of economy, what can Montgomery afford to pay to get out of jail. It is a certainty that he and his family have spent every dime they have to get to where they are now. They have provided evidence to a court and that court has ruled that there has been a miscarriage of justice. Yet the Governor has not taken up his pen to set the man free. "The attorney general is required to follow the law. The court's November 9th order to vacate Mr. Montgomery's convictions, however well intentioned, is void under the law. The attorney general and his staff are working to help correct a mistake not of our making and of which we were notified only after the fact. "In situations like this, the law prescribes that Mr. Montgomery apply for the writ of actual innocence to the Virginia Court of Appeals or seek a pardon from the governor. "We are moving everything on our end as quickly as possible, but, technically, our only official involvement in this case thus far is as counsel to the Department of Corrections because this office responds to suits on behalf of the commonwealth and state agencies. We have offered to work with Mr. Montgomery's attorney and the local commonwealth's attorney any way we can, as has been the case with the three other actual innocence cases Attorney General Cuccinelli has been involved with, to ensure the correct procedures are followed in Mr. Montgomery's case. To do that, we think the appropriate vehicle is for Mr. Montgomery to file a petition for a writ of actual innocence with the Court of Appeals, then we can respond and the Court of Appeals can evaluate the evidence. "As of late Wednesday afternoon, we had heard reports that Mr. Montgomery's attorney did not intend to file a writ, but rather intended to pursue bringing Virginia Department of Corrections officials into court to ask a judge to order them to follow the invalid release order. The Daily Press reported today that his position seems to have changed at least regarding the writ, and he has finally decided to prepare such a writ, which will get the process moving. "The Daily Press also reported that the governor's office said Wednesday night that it had not received a request for pardon from Mr. Montgomery's attorney, and the attorney told the paper he was not pursuing one. "Regarding previous dismissals made by circuit courts after the 21-day rule, we cannot speak to them without knowing what those specific cases are. When we looked into the one case that was mentioned by name yesterday, we were not advised until after the fact in that instance, and it appears the person was actually pardoned by then-Governor Kaine. If the other cases involved a local jail sentence (ie. the person was not sentenced to a state facility), we would never have seen the case because our client, the state Department of Corrections, would not have been involved in the release. "Whether we agree with it or not, the 21-day rule is the law in Virginia, and as the lawyer for the state, the attorney general cannot and will not recommend that any court or law enforcement agency violate the law. The only avenues to overcome the 21-day rule are a writ of actual innocence or a pardon or commutation, and neither a pardon nor commutation are within the authority of the attorney general. Additionally, even if the attorney general takes a position that a writ should be granted, that does not ensure it. It is still up to the court whether it will grant the writ." A copy of this news release may be found on the attorney general's web site here. Is Accomack County's Administrator Living Up to the Claims He Makes on His Web Page? 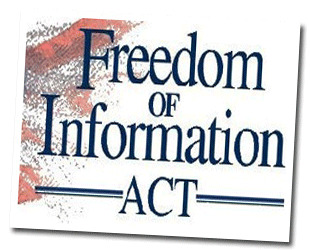 Hardly would seem to be the answer after reading the reply he made to a Freedom of Information Act Request [FOIA] sent to him by Douglas Buckley of Virginia's Unalienable Rights Foundation [UARF]. Part of our mission as defined by the Board of Supervisors is to run an open government - sharing data, knowledge, public records and information with the public and this site is one great way of doing that. It also serves as a place to get information from you on matters which are important to you. We hope that this site helps us to partially meet that mission and that you find it of use. While visiting, if you have suggestions for improvements or wish to comment on anything, please send us your thoughts! Incidentally, we hope in the future to offer on-line transactions. Thank you. I [Douglas Buckley] am here today in my capacity as a Senior Forensic Evidence Fellow / Civil Rights Division of the Unalienable Rights Foundation [UARF] to examine/ be given access to records . . . the indexes that reflect and/or the written proffers the governing body of Accomack County [AC] and/or the Accomack Board of Supervisors [BS] and/or by any other name they have been or maybe called, has proffered since 1634 to date whether it was proffered by ordinance or resolution or any other form of legislative act or executive act, by whatever name it might be called, that says what form of County government Accomack County operates under . . . dealing with the form of Accomack County’s government and would make Accomack County and it government and acts in compliance with the Dillon Rule [DR] that Accomack County must comply with.
. . . shall provide for preserving, classifying, arranging, and indexing essential public records so that such records are made available to the public. The program shall provide for making recovery copies or designate as recovery copies existing copies of such essential public records. Virginia Code § 42.1-86. So where is Accomack’s form of Government Here [in the attached] Mr. Miner? Where is it provided for that the county can have an administrator? Is it, that you hold your job illegally? You gave Mr. Buckley a lot of words in your response to his VFOIA request asking for documents that say/ show the county in in compliance with the Dillon Rule but you gave nothing citing your authority to be a county administrator nor that of the county to operate. SAND EIGHT HUNDRED AND EIGHT. and the acts of the legislature and Virginia’s Constitution to date and nothing was found/ has been found that says what you or the County is/are/have done is in accordance with Virginia law or in accordance with any treaty the United States holds with Great Britain [yes we’ve looked at all relevant treaties]. And just in case we overlooked something we have gone/come to you, the Attorney General and the Secretary of the Commonwealth to ask what form of government the county operates under and the authority for it to operate as it is. None of you have provided that information. The Secretary’s office, via Mr. Mayfield [via telephone call] went so far as to say the Secretary’s office would not respond in writing but in fact it appears to the Secretary's office the county was operating in violation of the Dillion Rule, which was and has always been UARF’s impression of Accomack County’s operations. In previous correspondence with you and/or the county attorney, when UARF asked for a copies of any Library of Virginia form RM3 that deals with the destruction of county documents, UARF [its people/folks] was told by you both that the county has in its possession all of the documents, and that no documents had/has been destroyed since the beginning of time, the county had in possession all the documents. So now the time has come for you to answered the question, was I mislead then or am I being mislead now, do you or don’t you have the documents or form RM3. Its just that simple. Your letter to Mr. Buckley seems to me to say you don’t have them and don’t know where they are. You say maybe here or there or maybe they are elsewhere, but you know not where and or in your or the county’s possession. Since UARF previously sent a continuing preservation notice to the County, its officers and employees [whether legally elected/appointed/employed] there seems to be no need to send that 96 page document again. This matter can be quick handled just by your simply showing the County’s compliance with the Dillon Rule, providing the legal framework under which the County operates under daily or your saying you have no such documents.